“It was honestly probably the most amazing experience I ever had. … There’s really no words to describe it,” said Haeden Suter, one of the students. Now nearing 20 years at Incline Village High School, the “We the People: The Citizen and the Constitution” program has created scores of civic-minded young adults, while serving as a symbol of community strength. This year’s We the People class embodied both of those elements: The 21 students — nearly 1/3 of the entire senior class — turned in one of the strongest performances in the recent memory; and the community rallied to raise the $70,000 needed to make the trip to D.C.
“You cannot have a successful We the People program unless you’re able to get support from the community,” explained Milton Hyams, a teacher at Incline Village High who brought the We the People program to the school nearly two decades ago. We the People was created in 1987 as part of the federal Constitution’s bicentennial. The success of the program at the Bicentennial Commission led to Congress continuing the program through the U.S. Department of Education from 1993 to 2011 as an authorized program of the Elementary and Secondary Education Act, according to the Center for Civic Education. More than 30 million students and 75,000 educators have participated in the program since its inception. The program is essentially part history/civics class and part debate. The class culminates with a simulated hearing, in which the students testify before judges who act as members of Congress. 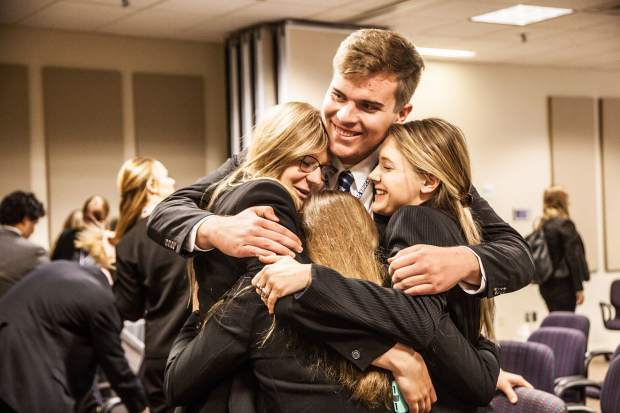 The testimony is competitive with teams advancing to state and, if they’re strong enough, to nationals in D.C. The Incline class doesn’t make it to D.C. every year, but it has a strong track record, which Hyams says is especially impressive as the competition has toughened each year. Most of the teams that finished ahead of Incline came from schools with much larger student populations. “I think that this year’s showing is, in a lot of ways, just as impressive as we’ve seen … this crew is a tremendous group of students,” Hyams said. One of the characteristics that separates this class from previous ones is its diversity. While the participants are admittedly strong students, they have varying interests. The student body president is on the team, as are a number of athletes. There are students who work 20 hours a week outside of school. “This group of students in particular was in a lot of ways a magical blend of intellect and street smarts … they just had the combination of being sharp but personable, hard working and experienced,” Hyams said. Students who participate in the program say there is a discernible change in themselves. They are more engaged in current events, more critical when given information. Those who shied away from public speaking are more confident and proud. And they all have a deeper appreciation for the U.S. and the democratic process.